Even before war was declared on September 3rd 1939 the UK government had set up an evacuation scheme for civilians in areas of Britain that were likely to be at risk from aerial bombing. Evacuation of children and other groups such as disabled persons and pregnant women, from major towns and cities to rural areas. began on September 1st. Many of the evacuees soon returned home as there were no attacks on Britain during the first eight months of the war, but the fear of a seaborne invasion in June 1940 and beginning of the ‘Blitz’ air raids on London and other cities in September 1940 prompted further urgent evacuations. More than 3.5 million people were moved to live with families in safer ‘reception areas’ of which South Cambridgeshire was one. 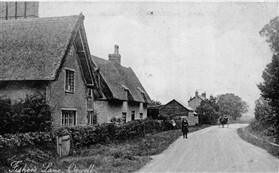 Nineteen-year-old Peggy Miller, of Manor Farm, was the billeting office for Orwell. In the early part of the war heavy bombing often kept us in our air raid shelter for days on end. Eventually we got bombed out of Bow and got moved to Dagenham, Essex. When we got there we were evacuated to Yarmouth. We stayed there two weeks, before mother brought us all back again to Dagenham as the life there wasn’t what she wanted for us. The house at Dagenham was made uninhabitable by bomb damage and we were then evacuated to Orwell. Unbelievably, on the very day we came here to escape the bombs, one was dropped on the roadside very close to Maypole farmhouse, but thankfully no damage was done. In those wartime days men couldn’t choose where they worked and my father and uncles were moved to this area, one of them to work on the aircraft at Bourn, one to work for Shell Oil near Sandy and my father to work at Mackays engineering company in Cambridge. I was nine years old when we got here and went to school in the building at the top of Town Green Road which is now a private house. There was no room for us evacuees in the school; there were no chairs so we just sat on the floor and we were kept separate from the local children. We were not accepted by them as friends and we were often bullied. We also often had to take the blame for any wrong doing by the other children. As there were no teachers my eldest sister, aged thirteen, used to teach the younger ones. The only teacher was busy teaching the local children. All I can remember was building models out of paper and cardboard. As for lessons, they were non-existent. Even back in London I had only gone to school for half a day a week, in the headmaster’s house, as our school had been bombed out. I never had a table and chair to work at until I moved to Harston School when I was eleven. Even then, we were put to work on the village allotments in all seasons, rather than getting formal tuition in school. We ate like lords compared with Londoners. The farm provided many things such as fresh eggs, milk and vegetables, and we saw for the first time where they came from – from chickens, cows and soil. In London everything came from the shops. We used to fetch milk sometimes from the dairy down by The Wheatsheaf. Dickie Long taught us many things about country life, such as how to snare rabbits, and I remember watching Flack’s steam ploughs working on Orwell Hill. Some of Jim’s relations returned to London after the war, but Jim’s father settled in Hauxton where he worked for Pest Control. Jim worked hard at night school and at Cambridge Technical College to catch up on his delayed education and served an engineering apprenticeship; he started and finished his working life as an engineer at Pest Control (later Fison’s) but also worked at Lister’s and at Dan Morley’s Engineering Co. in Cambridge and now lives with his wife Rosemary in retirement at Hauxton. 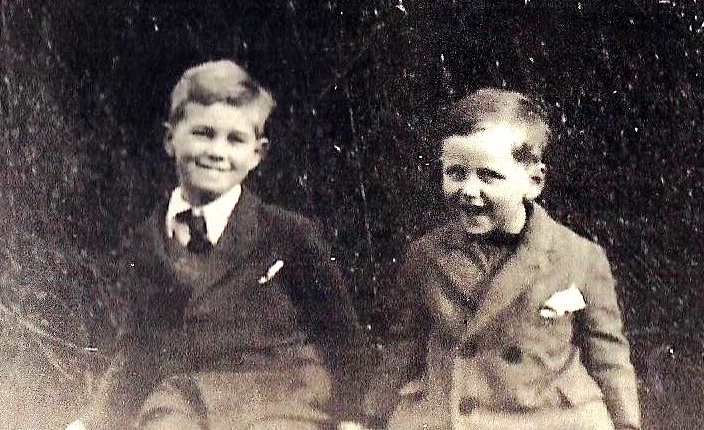 My elder brother, Peter (aged 7) and I (aged 5) were sent to Orwell as soon as the war started in September 1939. We were part of a group from the Oratory Roman Catholic Primary school in Chelsea; no parents came, just children between five and eleven years of age on our own, escorted by a Priest from the Oratory Church. This is next to the Museums in South Kensington. Our mother had only recently had twins at the start of the war, Michael and George, (born in April 1938). As they were so young, she was not allowed to leave London until 1940, first going to stay for some months in Cambridge with the twins. Peter and I stood outside the old schoolhouse, waiting to be chosen. I clearly remember Peter and myself standing with the other evacuees outside the old schoolhouse waiting to be chosen by the unlucky people of Orwell who were forced to select someone to look after. We were the last two to go! Because we were the last, a lady called Miss Collins ended up as having to take us on - but this only lasted for a short time as we soon wore her out. We then transferred to a Mr and Mrs Neaves who had a car. We soon had to move on again when Mrs Neaves decided that she was having a baby and we would be too much for her to cope with. We were despatched then to join a Mrs Wilkins who kept a very tidy and neat house. While in her care, our mother and baby twin brothers (then aged 2 ½) were invited to stay overnight during a visit from Cambridge. A cheap paint, called ‘distemper’, not paper, decorated the walls of our flat in Chelsea so, having found a new interest, they started to tear the wallpaper from the walls. That soon created a further move! This proved to be good because we were offered the use of a house, 5 Fishers Lane, occupied on his own by an old man, Mr Gill, who really needed looking after. It was arranged that our mother, Peter, I and the twins could all move into his house and there we stayed, with our mother looking after us and the old man’s welfare until we returned to London after the ‘Blitz’ at the end of 1941. This made the situation ideal for the family and my mother really enjoyed this period of her life. My main memory of Mr Gill’s house was that there was only a loo, with a bucket, in a shed in the garden. No bathroom in the house. He used to count "one, two, three" and throw the contents of the bucket over his garden, saying that it was simply manure and would help the vegetables grow. Peter and I took a long time to develop a liking for vegetables after that! On 3 November 1941, considering London to be a safer place now that the ‘Blitz’ was over, we all moved back to our flat in Chelsea (not Mr Gill, of course). There, between 1942 and 1945, we survived bombing from manned aircraft, V1 engine powered aircraft which were unmanned and known as “Doodlebugs” and V2 Rockets – but the really good thing was that we were, at last, reunited as a family with our Mum and Dad. Playing under a bridge by a "river" which, on inspection many years later, turned out to have been a ditch under Town Green Road. An armoured vehicle of some sort being abandoned for a while in a roadside ditch - a great source of childish play and imagination for a brief while. The twins using the family gasmasks as buckets in the ditch outside the house. The twins (again) knocking over some beehives on a family picnic down the Orwell Road and a rapid withdrawal from the scene to escape the swarm. The twins (of course) opening the taps of a barrel of oil in the Flacks' yard with the loss of all its contents. Oil was, of course, at a hefty war-time premium. The Church, the schools, one Post Office/sweetshop and Millers' Stores in which Peter notoriously made purchases on credit, telling them that "mum will pay". The Flack family who had a steam engine in the front of the house. A well at the roadside, possibly in the High Street, outside a house in which, our imaginations told us, a witch lived! The only contemporary name that springs to mind of a local lad was a Malcolm Freestone, who turned up at the house one day telling my mother not to let me go out as there were heavy convoys going down the main road and it could be dangerous. I was already out there enjoying the excitement.. I have no recollection of pining for home or missing London. The villagers made us welcome and this made the difference. We owe them a debt of thanks. If you were evacuated to Orwell, or had evacuees billeted with you, please give us your memories in the Comments box below! This page was added by Sue Miller on 04/01/2014.